This peripheral is worth traveling with. Of all the folding keyboards I’ve reviewed so far, the iClever Backlit Foldable Keyboard stands out as the best. Others that I’ve evaluated all sacrifice usability in the name of portability, but not this one. Priced at $55, the iClever Backlit Foldable Keyboard’s a little more expensive than the majority of its rivals, but if you’re looking for a compact, folding keyboard that you’ll actually want to type on, it’s worth every penny. 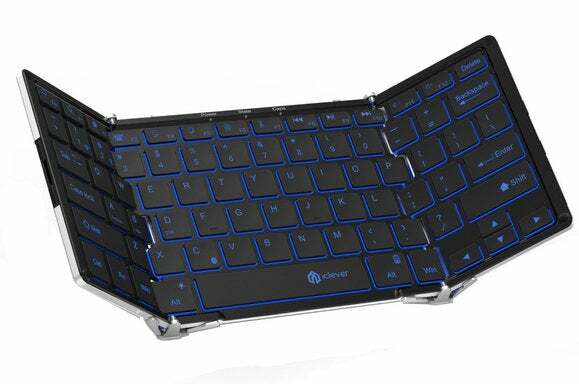 The iClever mirrors the design of the Jorno and EC Tech-style keyboards, from the outer shells made from anodized aluminum all the way down to how the hinges work. But where you get a keyboard that’s about 80% of the size of a regular desktop keyboard from the Jorno or EC Tech hardware, the iClever provides what appears to be a full-sized keyboard. Yes, the iClever is heftier and bulkier as a result. It weighs 14.4 ounces, and measures 11.46 x 4.61 x 0.32 inches when opened for use. 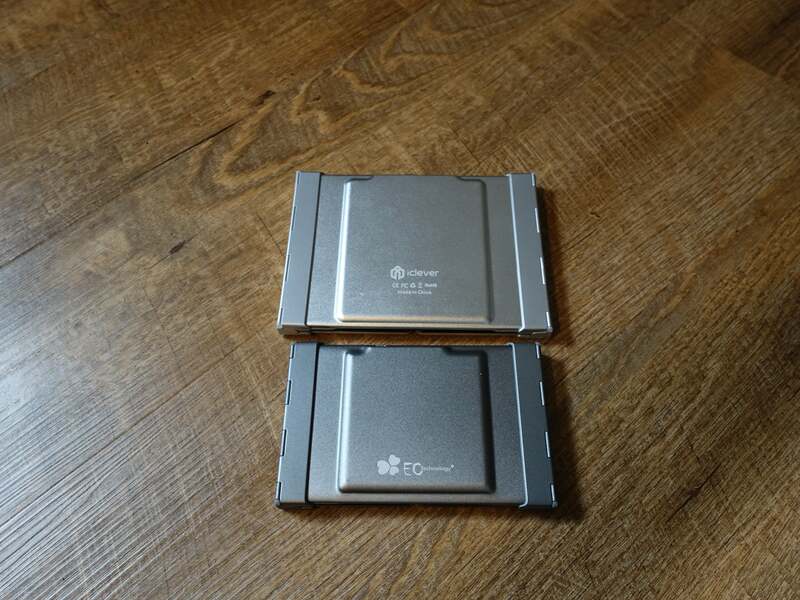 Folded up, the iClever’s size reduces to 6.54 x 4.72 x 0.58 inches. That extra weight and space pay dividends when the time comes to do some typing, though: The iClever has keys that are nearly the same size and have nearly the same amount of space between them as on a late-model MacBook Pro. 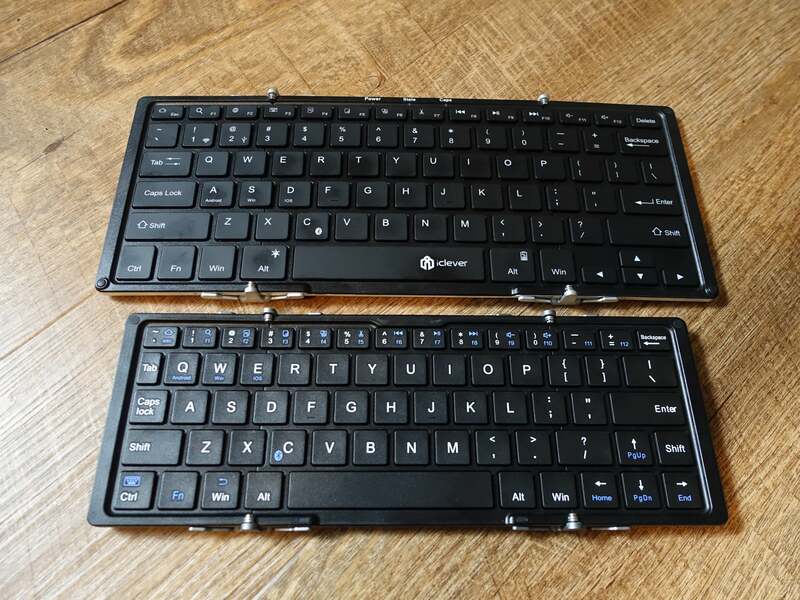 After spending considerable time with the iClever’s overly shrunken or poorly laid-out rivals, using this larger keyboard felt absolutely liberating. This keyboard pairs with Android and iOS devices without any issues, as well as Macs and Windows machines. Once connected, I could type at full speed with the same accuracy as on my laptop’s keyboard, even while touch-typing. The function keys at the top of the keyboard are well-sized too, with dedicated keys for music control, volume, search, and a number of tablet-related shortcuts. What’s more, the keyboard’s designers solved a problem that both the Jorno and EC Tech keyboard suffer from: No matter how hard you hit a key on the outside edge of the keyboard, the iClever won’t tip. A small, folding leg on each end of the keyboard keeps it stable. I found the key travel to be just as satisfying as with the Jorno and EC Tech hardware. However, I must admit that the plastic that the keys are made from don’t feel as high-quality. This difference could be a result of the keys’ backlighting—they’re hollowed out so that the light can shine through. I can easily live with this design choice, though. If I had to choose between a non-backlit keyboard made from better-quality plastic but with a less enjoyable typing experience, and a backlit keyboard that feels sturdy and allows me to type at full speed in any lighting condition, I’d choose the backlit option every time. According to iClever, users can expect about five hours of use from the keyboard between charges with the backlight on, and up to 30 hours of typing with the lights turned off. That’s the good—let’s talk about the mediocre. Unlike the Jorno, the iClever doesn’t come with a case that does double-duty as a tablet stand, nor does it come with a built-in stand like the ZAGG. But let’s be honest: There are a gazillion lightweight device stands out there. Chances are, your tablet case already has that feature. So, no big loss there. The iClever does come with a storage bag, which is a nice touch. It keeps the keyboard’s aluminum shell from getting scratched up as it bounces around in your backpack. The bag is cheaply made and just barely fits the keyboard, however. Battery life is definitely a drawback for this keyboard. I’m especially disappointed with the short amount of runtime when the backlights are on. Five hours isn’t enough, especially for a student, journalist, or other individual who fills their day with the written word. Turning off the backlight or charging the iClever at the end of every day is a drag. But having considered the pros and cons of all the folding keyboards I’ve evaluated so far, the iClever is still the best choice for individuals who want to get some serious work done. Just don't stray too far from AC. The iClever Backlit Foldable keyboard is a bit heavier and bulkier than its rivals, but you do get an excellent typing experience. Its main drawback is very short battery life, which is just five hours when backlighting is left on.